Apple might want to reconsider its security practices as iPhone thieves seem to be getting bolder by the day. 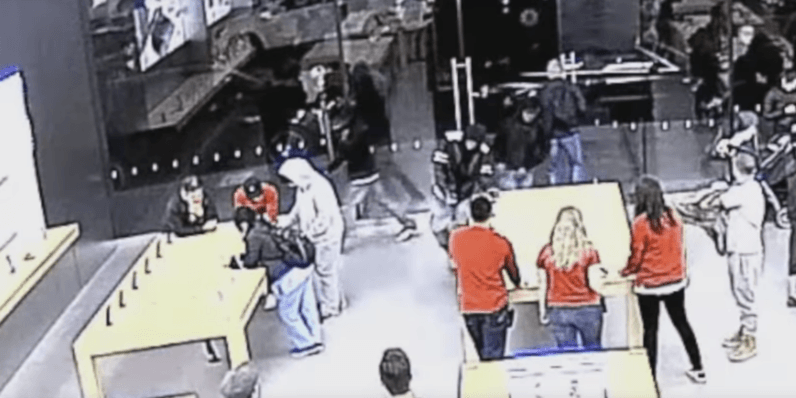 San Francisco Police Department has released footage of two recent Apple store robberies in the Bay Area, which took place on November 25 and November 29 (respectively) in the vicinity of Chestnut Street in San Francisco. The first video captures three perpetrators daringly walk in, grab whatever they can and swiftly storm out – and all of that in the window of less than 15 seconds. Similarly, the second clip catches four men perform the same maneuver with almost identical pace. In both cases, startled staff and customers merely watch the criminals make off with a bunch of gadgets in their hands. While police hope the released footage yields new leads for the investigation, a spokesperson for SFPD has commented that no arrests have been made and the hooded miscreants remain at large. This isn’t the first time the Big A has suffered similar accidents. Earlier in June, New York Police department reported that ballsy bandits have been dressing up as Apple employees to surreptitiously jack iPhones from its stores. In October, iPhone thieves in Natick swiped $13,000 worth of goods from another Apple store based in Massachusetts. On a separate occasion, a disgruntled French man brutally vandalized an Apple store in Dijon, smashing a pile of iPhones, iPads and MacBooks with a steel ball. While criminals these days surely have a penchant for Apple products, the Big A has recently started doing away with tethers at its stores. The reason being that its newest gadgets are equipped with tech which allows the company to disable stolen devices remotely, rendering them completely unusable. So… not such a great heist after all.